History of golf at Barton-on-Sea Club dates to the late 19th century. The game was played for the first time in 1897 on a 9 hole course at the Barton Court Hotel, west of today’s course. Just like elsewhere in the UK, golf became increasingly popular at Barton-on-Sea at that time and the guests of the Barton Court Hotel appreciated the ability to relax playing golf on the Hotel’s course despite the fact that it was relatively primitive from today’s point of view. Besides hotel guests, the golf course at the Barton Court Hotel was also enjoyed by local golfers grouped around Sir Robert Affleck who were also allowed to organise occasional competitions and formed a golf club. The course at Barton-on-Sea remained unchanged until 1909 when it was expanded into a 18 hole course. 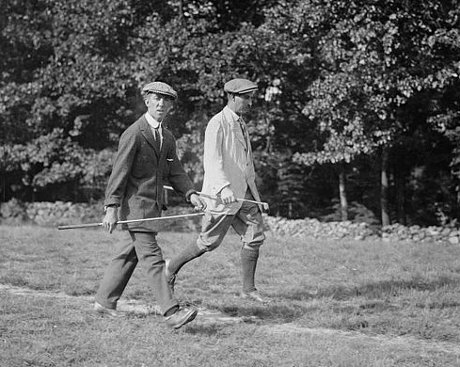 The new course was designed Harry Vardon, one of the best professional golfers at the time (he won as many as 6 Open Championships and 1 US Open). Vardon’s course was enjoyed until the early 1920s when it was converted into a building land to meet the needs of the rapidly growing community of Barton-on-Sea. But at the same time, the local golfers persuaded the Grand Marine Hotel owner that he would benefit from a golf course. He agreed to build a course and Harry Vardon was hired to design the layout for the second time. But this time he designed a 9 hole golf course which was partly situated on the original site. This golf course opened in 1922 and was enjoyed by golfers (mainly the local ones) for a decade. In 1927, the Grand Marine Hotel was purchased by A.S. Clarke who played an important role in the future of the Barton-on-Sea Golf Club and golf at Barton-on-Sea as such. Almost immediately after acquiring the hotel, he leased a land adjacent to the Vardon’s 9 hole course and commissioned one of the most renowned golf course architects of all times – Harry Colt. In 1932, Colt expanded Vardon’s course into an 18 hole course and most of his holes are still played on today’s 27 hole Barton-on-Sea Golf Club course. To make golf at Barton-on-Sea more enjoyable, Clarke also enlarged the clubhouse. In the mid-1950s, the Barton-on-Sea golf course and clubhouse were acquired by a property developer but he never carried out his plan to build houses on the site due to a strong opposition by the local community and of course, the golfers. To save the course and clubhouse, the Club led by Wilfred Hasseldine raised the necessary funds and paid out the property developer.